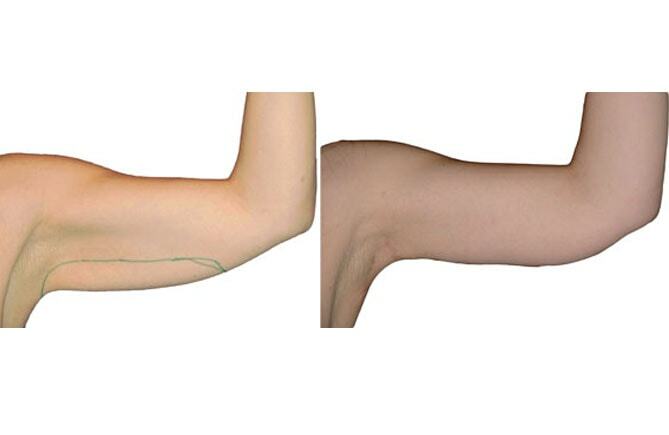 The upper arm lift is a procedure that is performed primarily due to massive weight loss. Regardless however many people are constitutionally strong in the upper arms, which disturbs. 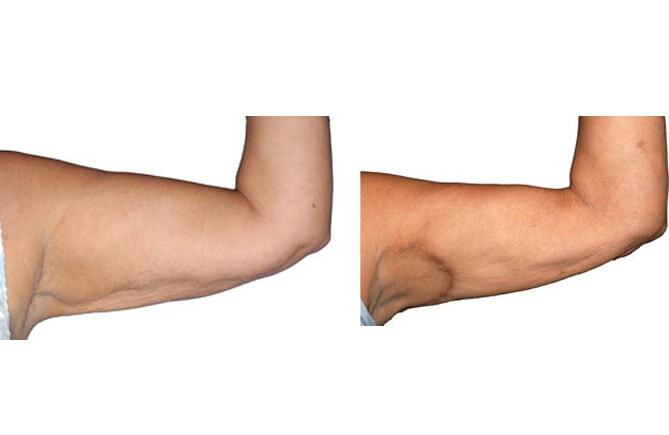 Also disturbing is the appearance of wrinkles on the inside of the upper arm, even with normal size upper arms. The method with the crescent-shaped incision reduces the amount of the upper arms only slightly, but the skin is able to be tightened on the inside, and thus eliminate wrinkles. The method with the incision along the inside of the arm is very effective; it significantly reduces the volume of the upper arms and also removes wrinkles. In the vast number of my patients, the excess skin is serious, so the long incision is necessary much more frequently than the crescent-shaped cut. Ideally, the scar is placed so that it comes to lie exactly at the transition of the inner upper arm and back. In this way, it is hardly visible in either the front or the back. 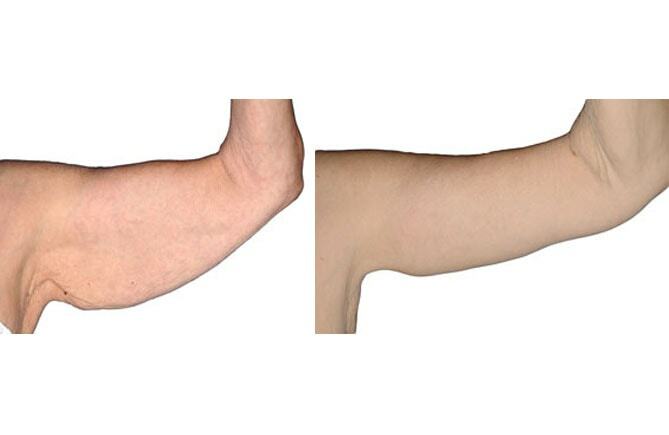 An important aspect of the arm lift is the prevention of skin tension in the armpit region, which can lead to a further relaxation of the skin and to a distortion of the skin incision in the direction of elbow. To this end, the skin must be anchored with a dermis flap to a solid structure in the axilla . If a reduction of size is desired, and the skin is still taut, liposuction alone can achieve very good results. 1. 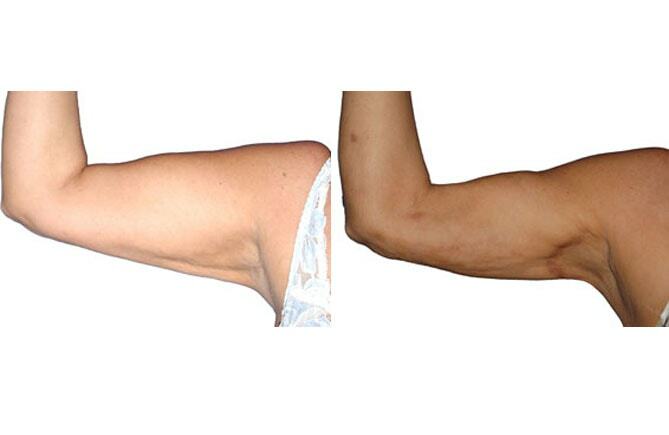 Can a reduction of the upper arm circumference also be achieved with liposuction? If there is no excess skin or when the skin is still taut yet, quite a good result can be achieved with liposuction. 2. What are the methods of the upper arm lift? There are basically two ways that depend on the extent of the excess skin to be corrected. 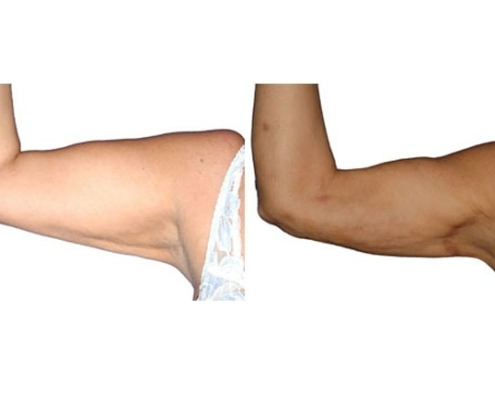 With low to moderate skin excess, intervention can be restricted to the axillary region, if there is more to do, then the intervention will be extended to the upper arm. 3. Where does scarring occur? 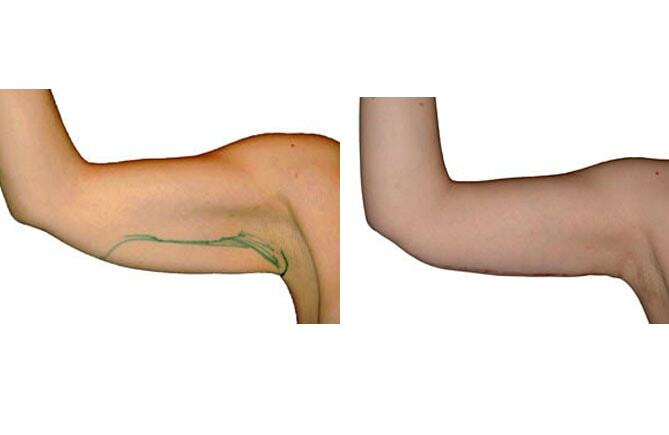 Depending on what surgical method has been used, the scar either runs from the shoulder, starting along the inside of the upper arm to the vicinity of the elbow or is confined to the axillary region. If the skin incision is limited to the axillary region, the scar is visible only with shaved armpits and raised arms. With the long incision, the incision is set so that it comes to lie at the junction of the inside upper arm and back. In this way, the scar is hardly visible from the front and the back. 5. Is the procedure carried out under local anesthesia? If the operation is limited to the axillary region, the procedure can be performed under local anesthesia. The long incision procedure is performed under general anesthesia. 6. Does insurance cover the cost of the procedure? Unfortunately not, as opposed to a tummy tuck, arm surgery is a purely aesthetic procedure that is not covered by health insurance. If the procedure is performed under local anesthesia, you can leave the hospital on the day of surgery. Under general anesthesia, one night in the hospital is to be expected. The most common medical complications include bleeding, infection and injury of a sensory cutaneous nerve. With careful implementation of surgery bleeding and infections are largely preventable. The injury to the skin nerves, however, is sometimes unavoidable, especially if the excess skin is strong and in the surgical field the nerve can not be saved. Aesthetic complications include asymmetrical scars, pulling out the anchoring sutures, dog-ear formation and keloids. Apart from the keloids, the correction of aesthetic complications by surgery is relatively simple. 9. How long after the operation is one mobile again? Relatively quickly. Barring complications, the arm is already fully operational again after a few days. Overhead sports should not be played for a period of four weeks in order to avoid exposing the scars to any unnecessary tension. 10. What are the long-term results after arm surgery? If you purchase the Enzyklopaedia Aesthetica book “Oberarm- und Schenkelstraffung” (Upper Arm & Thigh Lift) ( EUR 29.90 ) the first consultation is free of charge! You can purchase the book during your first visit in the ordination or order it online. EUR 700 – 1.500, – depending on duration of operation and hospital. In general, the procedure is performed under general anesthesia therefore an anesthesiologist is needed for surgery. The cost of anesthesia varies depending on the duration of the operation and is between EUR 400 – 800. An average cost of EUR 500-600 is to be expected. Depending on which method is used, (short or long cut) the surgical fee is between EUR 2.500-4500. Please note that the investigations at the time of surgery may not be older than 10 days. Please bring all the findings to the hospital. Please note that you should not smoke for 10 days after the operation because nicotine constricts blood vessels and would compromise wound healing. Discharge from the hospital either on the day of surgery or the following day if the operation was performed under general anesthesia. Please do not drive yourself. Take a taxi or allow yourself to be picked up. 2nd Follow-up Visit (approximately 10 days after surgery): Removal of sutures. Further follow-up visits will take place after one, two and six months.